Homily for The Epiphany - 300th Podcast! With the beginning of the new year, a spring time of sorts comes early to our parish - the beginning of sacramental preparation of our children for their First Confession and First Communion, of our young adults for their reception of the Sacrament of Confirmation, of many couples preparing for Holy Matrimony in what will be a busy schedule of weddings throughout the year, and of many parents preparing for the Baptism of their children. We have 17 of our children preparing for their First Confession and First Communion, 18 of our young adults preparing for Confirmation, and we will celebrate approximately 30 weddings throughout this year. We have one seminarian, Ben Pitre, who will continue his studies in the Fall at the North American College in Rome, Italy preparing for Holy Orders and thereafter serving as a priest of our diocese. Next weekend, we will administer the Anointing of the Sick in conjunction with the World Day of the Sick at the 4pm Saturday, February 8 Mass, for all those who are in need and would like to receive the sacrament. Please see the announcement in this bulletin for details on it. Anointing of the Sick, of course, is available at any time for those in need. Just call the office to set up a time for a visit. It is a good time for us, a parish community, to reflect on the goodness of God in giving us the gifts of the sacraments, which are channels of grace that help us to live the Christian vocation given to each of us. Please remember in your prayers all those preparing to receive sacraments this year, their families and our church community, as these times are definitely times of joy and thanksgiving for all! The bulletin for the week of February 02, 2014 has been posted. Click here to see it. The road conditions are still very bad out there this morning. There is plenty of ice around St. Landry Catholic Church as well. Today, keep in your prayers the many support personnel who must travel in these conditions - fire fighters, police, health care workers. Weather conditions look to be better for noon time Thursday. Stay warm and safe. Due to safety concerns, we will cancel noon time mass today at St. Landry Catholic Church. Stay safe everyone! The current week's homily is available on a link on the front page of the website next to the link for the current week's bulletin. On the page with the prior bulletins, the corresponding homily will be sitting side by side with its bulletin. We started on the anniversary of the start of the Catholic Church, Pentecost Sunday --- over four years ago. This week, the Third Sunday in Ordinary Time, is our three hundred and fourth podcast to be posted. The homily is given by Father James Brady. We hear today in our Gospel reading from St. Matthew the call of first apostles. It brings to mind God's call to vocations in general, that is, to both marriage and religious vocations, but also more specifically vocations to the priesthood and consecrated life. Over the last several decades there was a decline in the number of men and women entering into these vocations in the more developed parts of the world. However, the number of vocations have been generally good in the less developed parts of the world. More recently, for us in Louisiana and in the United States, the number of vocations have generally increased, and that is a good sign. In our parish we are blessed to have a seminarian studying for the priesthood, Ben Pitre. Please keep him in your prayers. Although God is the One who calls people to a particular vocation, one sign of a healthy parish community is that it provides fertile ground for religious vocations. It should be remembered that every person entering a religious vocation comes from a family. Although the call to a religious vocation is ultimately made by the Holy Spirit, families provide the fertile soil where consideration of a vocation can take place and develop. In a very real way, the priests and religious you encounter are a reflection of our families and our society. This is why a strong and devout family life, beginning with healthy marriages and good parental example, is so important. One problem with religious vocations is that many of our young people never consider it, as they are not encouraged to do so within the family. That is a shame, as the religious life, from my experience, is a wonderful life-giving gift and can provide great joy and peace to the person living it. In our prayers for more vocations to the priesthood and religious life, let us all be reminded of our duty to provide fertile soil and proper encouragement by both word and deed in helping to cultivate religious vocations. There will be a vocations supper for men considering the priesthood on February 26 at 6:30 pm in Lafayette at the diocesan offices. If you know of someone interested in the priesthood, please encourage them to attend the dinner by calling me at the parish office, or if they would like, I am most happy to meet with them and answer any questions they have. 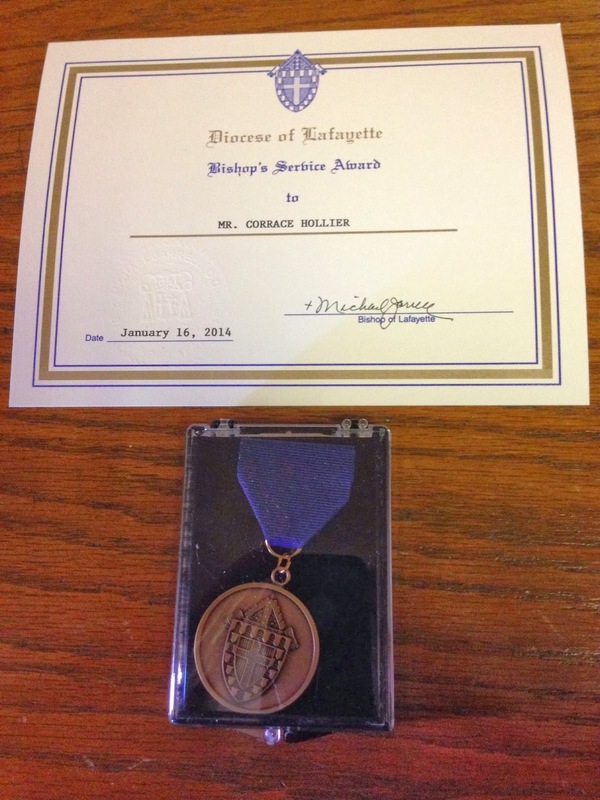 The bulletin for the week of January 26, 2014 has been posted. Click here to see it. 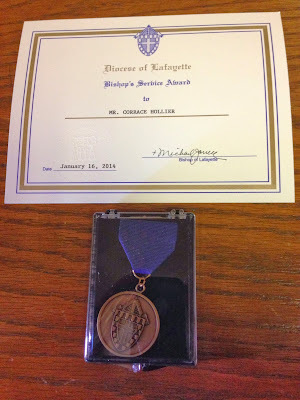 With the recommendation of Father James Brady, I am very pleased to present to you the enclosed Bishop's Medal and Certificate. I am grateful for your devoted service to your Church and your community. 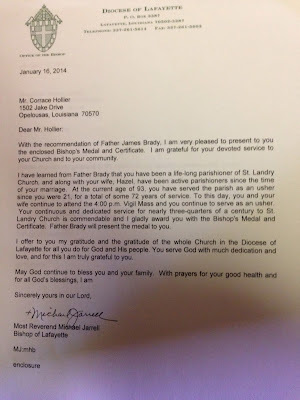 I have learned from Father Brady that you have been a life-long parishioner of St. Landry Church, and along with your wife, Hazel, have been active parishioners since the time of your marriage. 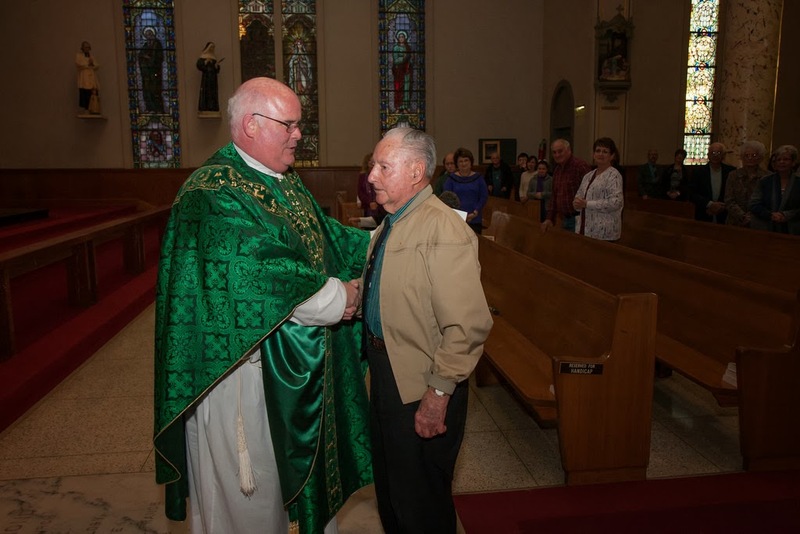 At the current age of 93, you have served the parish as an usher since you were 21, for a total of some 72 years of service. 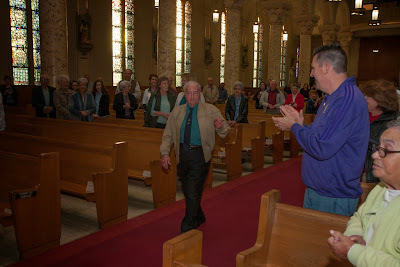 To this day, you and your wife continue to attend the 4:00 p.m. Vigil Mass and you continue to serve as an usher. Your continuous and dedicated service for nearly three-quarters of a century to St. Landry Church is commendable and I gladly award you with the Bishop's Medal and Certificate. 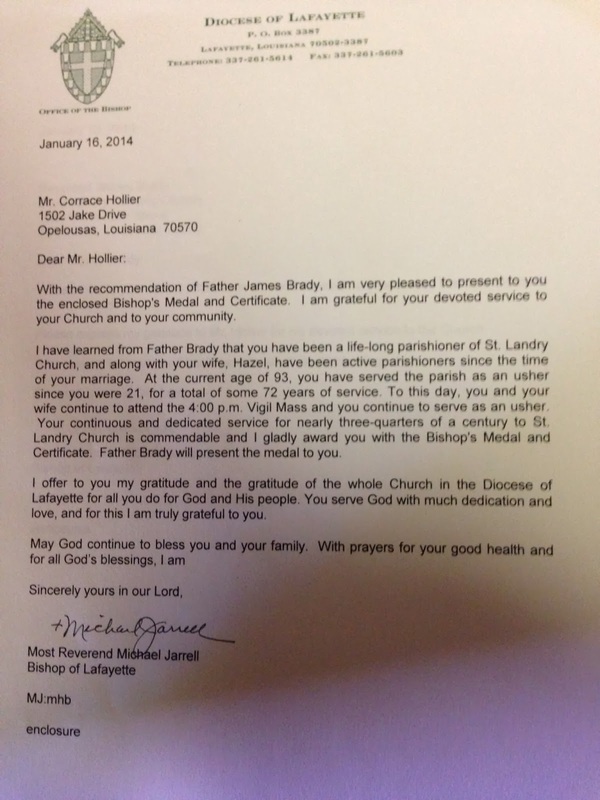 Father Brady will present the medal to you. I offer you my gratitude and the gratitude of the whole Church in the Diocese of Lafayette for all you do for God and His people. You serve God with much dedication and love, and for this I am truly grateful to you. The current week's homily is available on a link on the front page of the website next to the link for the current week's bulletin. On the page with the prior bulletins, the corresponding homily will be sitting side by side with its bulletin. We started on the anniversary of the start of the Catholic Church, Pentecost Sunday --- over four years ago. This week, the Second Sunday in Ordinary Time, is our three hundred and second podcast to be posted. The homily is given by Father James Brady. Last week we discussed our Baptism and what it means to us. In our Baptisms, we are all given the Grace to live a good and holy life in Christ, and if we cooperate with that Grace, will receive the reward of Eternal Life in Heaven. It does not mean that our life will be easy while we live on earth, but if we do live a good and holy life here then we will receive the gift of eternal joy and peace. As we begin a new year and our children return to school, we are reminded of two things: The gift that they are to us and the sanctity of life. In that regard, I mentioned last week that we will be reconstituting our CCD program this Fall for our children in a format relying on home study and parental teaching, since it is the parent's primary duty to educate the children with whom God has entrusted them. It is in this way that we give our children an understanding of their faith, a gift that will last a lifetime. Parents will be provided support from the church in monthly meetings, and weekly lessons will be taught by the parents in their home at a convenient time. One benefit of the program is that the times are flexible and parents can choose the times that best fit their family schedule. The informational meeting for this program will be Sunday, February 16, 2014 at 2pm in Valentin Hall. Some parents may feel that they are not suited well for this kind of instruction, however please do not be hesitant or intimidated. God has placed your children in your care, so He certainly has confidence in your abilities. So do we! As a church community, we will provide the training and support needed. The informational meeting on February 16 is just that, to provide information about the program. Therefore, if you think you might be interested, please come and find out about it. On Wednesday of this week we also will mark the 41st anniversary of the Supreme Court decision in Roe v. Wade, which required states to legalize abortion. Since that date, some 50 million children were never given the opportunity to be baptized and live the life God intended to give them, something we may take for granted. Science is slowly but surely catching up to what we've always known in faith, that life begins at the time of conception and should be nurtured and protected, just like any human being who has been born. None of us alone has the power to overturn the law, but we do have a vote and we can make our feelings known to others. This week I will be travelling to Washington, DC with a group of Seniors from Opelousas Catholic to participate in the March for Life so that we can witness to the dignity of life, from conception to natural death. Not all are able to make a trip to Washington, so there is an opportunity to witness at our local March next Saturday, January 25th, beginning at 10am at Our Lady Queen of Angels Church. I will be back in time to participate in the local march, and I hope to see you there! The bulletin for the week of January 19, 2014 has been posted. Click here to see it. The current week's homily is available on a link on the front page of the website next to the link for the current week's bulletin. On the page with the prior bulletins, the corresponding homily will be sitting side by side with its bulletin. We started on the anniversary of the start of the Catholic Church, Pentecost Sunday --- over four years ago. This week, The Baptism of the Lord, is our three hundred and first podcast to be posted. The homily is given by Father James Brady. This weekend we celebrate the Baptism of Jesus, which reminds us of our own baptism. In our Baptism the Gates of Heaven were thrown open to us and we received the Grace to live a Christian Life. However, we must cooperate with our Baptismal Grace. We can do this by undertaking prayer and the study of our faith in order to know better and grow closer to Christ in our words and deeds. As pastor, I believe our community at St. Landry should provide reasonable means for all of us to be "formed" into the life of Christ. Christian Formation is a combination of study, prayer and worship that directs and leads us towards Christ in the lives that have been given to us. In that regard, I am excited to announce four new programs that will be introduced over the next few months that will be directed towards our formation and the spiritual welfare for all in the parish. We will reconstitute our CCD program this Fall for our children in a format relying on home study and parental teaching, since it is the parent's primary duty to educate the children with whom God has entrusted them. Parents will be provided support from the church in monthly meetings, and weekly lessons will be taught by the parents in the home. The informational meeting for this program will be Sunday, February 16, 2014 at 2pm in Valentin Hall. Please mark your calendar if your family is interested in this program. In addition, we will begin 3 other programs in Lent that we hope will continue after the Lenten Season. We will begin two prayer groups, one for men and one for women. For men, we will begin the "That Man is You" program and it will be directed by Deacon Joubert. The meetings will be weekly and are tentatively scheduled for 6am on Wednesday mornings. For women, we will have a prayer group in the "Come, Lord Jesus" format, tentatively scheduled for Tuesday evenings at 5:15 pm. 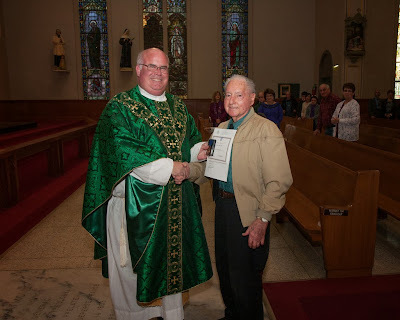 Finally, for those baptized adults who have not received the sacrament of Confirmation, we will have an Adult Confirmation Class led by Deacon Diesi on Monday afternoons, with Confirmation taking place at the Easter Vigil on April 19, 2014. The bulletin for the week of January 12, 2014 has been posted. Click here to see it. The current week's homily is available on a link on the front page of the website next to the link for the current week's bulletin. On the page with the prior bulletins, the corresponding homily will be sitting side by side with its bulletin. We started on the anniversary of the start of the Catholic Church, Pentecost Sunday --- over four years ago. This week, The Epiphany, is our THREE HUNDREDTH!! podcast to be posted. The homily is given by Father James Brady. As we continue to celebrate Christmastide this weekend, today we celebrate the Epiphany of the Lord. Traditionally, this feast was celebrated on January 6, ending the "twelve days" days of Christmas. We now celebrate it liturgically on the Sunday between January 2 and January 8. "Epiphany" comes from a Greek verb meaning "to reveal." Therefore, the Epiphany celebrates God's signs revealing to us Jesus' identity as true God, Messiah, and Savior of the world. It not only commemorates the fact that Jesus appeared to save us, but that God revealed Jesus' identity to the world. The Gospel reading for the day is from the second chapter of Matthew, where the magi from the east seek the newborn king of the Jews, and of course, find Him and pay Him homage. As we continue to celebrate the joy of Christmas for the remaining time in the Christmas season, we are reminded in the Epiphany that God not only sent his Incarnate Son as our God and Savior, but that He did so in a way that we could recognize, understand and follow Him in the way of truth and peace. Like the magi, our mission is to seek Him, come to know Him, and pay homage to Him by living our lives in the way Jesus taught us. Next weekend, we will celebrate the Baptism of our Lord after which we will return to "Ordinary Time" liturgically. With the beginning of Ordinary Time, we thank all those who made our celebration of Christmas so beautiful here at St. Landry. The music was wonderful throughout, and we thank our musicians and singers: The Adult Choir and their director J.P. Porrier, Curt Miller, and Marla Faust/Megan Wilkes. Our Altar Society did a wonderful job in decorating the church, and they were coordinated by Deacon Joubert and Betty Foret. We thank our various ministers at the liturgies, our readers, extraordinary ministers, servers and sacristans who volunteered their time and made adjustments to their personal schedules to serve us. We thank those who donated to the flower fund, making it possible to beautifully decorate our sanctuary and church. Our suppliers could not have been easier to work with or more helpful in every way: Jim Durio Florists and Lastrape's Nursery. And of course, our wonderful office staff and maintenance crew did a wonderful job over the course of the holidays. Thanks to all!! The bulletin for the week of January 05, 2014 has been posted. Click here to see it. The current week's homily is available on a link on the front page of the website next to the link for the current week's bulletin. On the page with the prior bulletins, the corresponding homily will be sitting side by side with its bulletin. We started on the anniversary of the start of the Catholic Church, Pentecost Sunday --- four years ago. This week, Mary Mother of God, is our two hundred ninety ninth!! podcast to be posted. The homily is given by Monsignor Louis Melancon.